A northern-hemisphere gyre in geostrophic balance. Paler water is less dense than dark water, but more dense than air; the outwards pressure gradient is balanced by the 90 degreees-right-of-flow coriolis force. The structure will eventually dissipate due to friction and mixing of water properties. 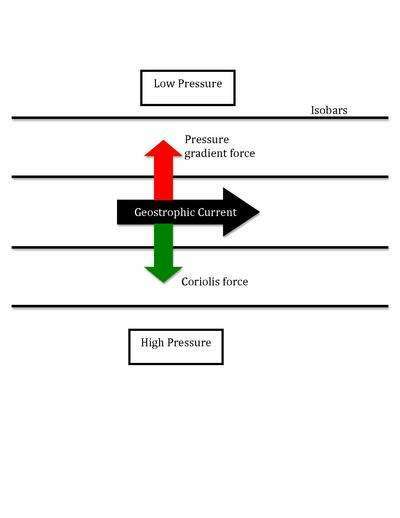 A geostrophic current is an oceanic flow in which the pressure gradient force is balanced by the Coriolis effect. The direction of geostrophic flow is parallel to the isobars, with the high pressure to the right of the flow in the Northern Hemisphere, and the high pressure to the left in the Southern Hemisphere. This concept is familiar from weather maps, whose isobars show the direction of geostrophic flow in the atmosphere. Geostrophic flow may be either barotropic or baroclinic. A geostrophic current may also be thought of as a rotating shallow water wave with a frequency of zero. The principle of geostrophy is useful to oceanographers because it allows them to infer ocean currents from measurements of the sea surface height (by combined satellite altimetry and gravimetry) or from vertical profiles of seawater density taken by ships or autonomous buoys. The major currents of the world's oceans, such as the Gulf Stream, the Kuroshio Current, the Agulhas Current, and the Antarctic Circumpolar Current, are all approximately in geostrophic balance and are examples of geostrophic currents. Sea water naturally tends to move from a region of high pressure (or high sea level) to a region of low pressure (or low sea level). The force pushing the water towards the low pressure region is called the pressure gradient force. In a geostrophic flow, instead of water moving from a region of high pressure (or high sea level) to a region of low pressure (or low sea level), it moves along the lines of equal pressure (isobars). This occurs because the Earth is rotating. The rotation of the earth results in a "force" being felt by the water moving from the high to the low, known as Coriolis force. The Coriolis force acts at right angles to the flow, and when it balances the pressure gradient force, the resulting flow is known as geostrophic. As stated above, the direction of flow is with the high pressure to the right of the flow in the Northern Hemisphere, and the high pressure to the left in the Southern Hemisphere. The direction of the flow depends on the hemisphere, because the direction of the Coriolis force is opposite in the different hemispheres. where is the Coriolis parameter. In this case, if we set , we have reverted to the geostrophic equations above. Thus a geostrophic current can be thought of as a rotating shallow water wave with a frequency of zero.